Use CEM II B-LL 32.5N cement or CEM II A-LL 42.5N cement, depending on the purpose and function of the plaster. As sand is the major constituent of a plaster mixture, its quality has a significant influence on the performance and material cost of the plaster mix. Sand containing oversized particles and lumps is unsuitable. Depending on the exposure to weather conditions of the plastered surface, different types of plaster mixes are recommended. Refer to section overleaf for the correct mix proportions. 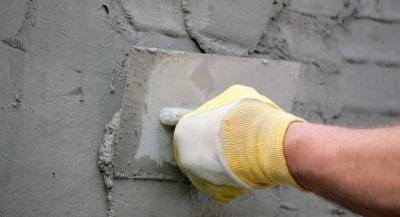 It is important to mix the concrete in exact accordance with these specifications. Add clean water while mixing until the right consistency is reached. Warning: If the plaster mix has hardened and is not workable anymore, that batch of plaster mix has to be discarded. Do not attempt to mix additional water into the mix, as this reduces the strength and adhesive properties a of the mixture. At any one time, only prepare the amount of plaster that can be used up within 90 minutes or before the mixture dries out. Please ensure that the surface is clean. Pre-moisten the surface before the work commences. Apply screed strips before the wall is plastered. These narrow strips of plaster placed along the perimeter of the wall, or at suitable intervals on the wall, act as guides for the striker board. 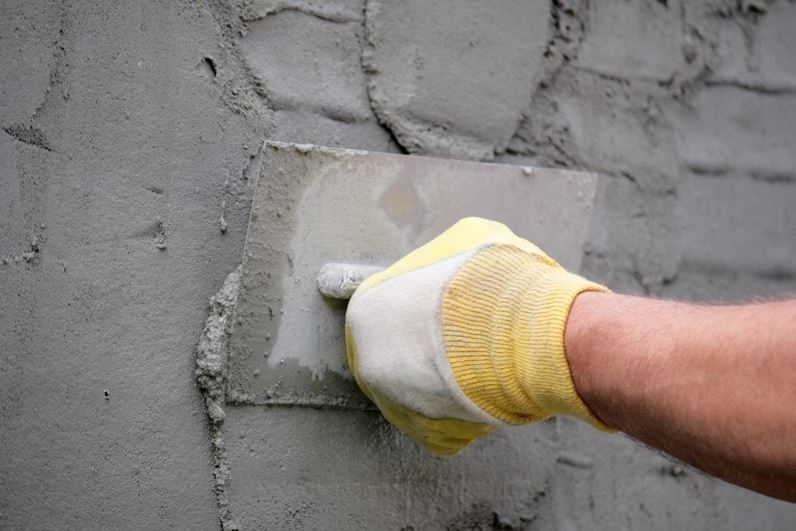 Using a rectangular plasterer’s trowel, push the plaster onto the wall or ceiling using heavy pressure, in order to compact the plaster and ensure full contact with the substrate. Once the plaster starts to stiffen and dry, the surface should be smoothed off with a plane or using a light striker board or straight edge. Any material removed in this way should be discarded. If the plaster is to be applied in more than one coat, the undercoat(s) should be scored by roughly parallel lines about 20 mm apart and 5 mm deep. The purpose of scoring is twofold: to provide an anchor for the next coat and to distribute any cracking so that it is less noticeable. For the final coat, use a wood float to remove any ridges made by the striker board. At the same time, fill in any depressions and float flush with the surrounding plaster. If the plaster is applied in a single coat, the thickness should be 10 – 15 mm. A single coat should be no thicker than 15 mm. The recommended thickness for the second undercoat is 5 mm – 10 mm and for the finishing coat 5 mm – 10 mm. Ensure that the plaster is not continued across the line of a damp proof course (DPC), as this will allow moisture to rise above the level of the damp proof course. The plaster should be scored through to the applied surface where different surface materials meet, e.g. masonry and concrete. After the plaster has been applied and finished, it is essential to protect it from the sun and wind by covering it with a plastic sheet and keeping it moist for a minimum of 7 days. NOTE: If a very smooth texture is required, a steel trowel may be used on the surface. However, such a surface is generally not recommended, as it tends to craze and show up imperfections. Various decorative finishes are possible. Techniques include brushing, flicking plaster onto the surface and lightly floating, etc. Warning: Plaster should be protected from the sun and drying winds. Any batch of prepared plaster should be used up within 90 minutes of being mixed and never be re-tempered by mixing with additional water. Spatterdash is a mixture of one part of cement to one and a half parts of coarse sand, with enough water for the concrete to have a sluggishly pourable consistency. Throw the mixture forcibly on the wall, using a scoop or a brush with long, stiff bristles. The spatterdash should cover the substrate surface completely and form a rough texture with nodules about 5 mm high. Spatterdash should be kept moist for at least three days. The surface should be tested for adhesion and strength by probing with a screwdriver or knife before plaster is applied to it. The texture of the masonry units should be sufficiently rough without need of further treatment. If not, apply a spatterdash coat. It should not be necessary to control suction of the surface by pre-moistening, unless the units are very absorbent. The texture of the bricks should be sufficiently rough without need of further treatment. If not, apply a spatterdash coat. Burnt clay stock bricks normally have a high level of water absorption, which results in rapid drying out of the plaster. If so, pre-moisten the wall and allow it to become surface-dry before applying the plaster. The volume of the wheelbarrow is 60 litres.